This is my current league starting character for Harbinger and it can farm all the endgame content relatively quickly and effectively. I wanted an all-rounder character this league and this one fits the bill pretty nicely I think. This Kinetic Blast Pathfinder build is so disgustingly fast you can farm any T11-T16 map with relative ease, generating massive amounts of currency through the sheer speed and IIR/IIQ on the gear. It shreds through massively sextant T15 Shaped Courtyards with full sextants slapped on em with a single click of the mouse. This is the original version that came before CuteDog and Zizaran's versions of the build, since they are streamers - obviously the cost of the gear has gone up. Make sure you set quality to 720p manually, Vid.me is kinda weird. All 4 Guardians Deleted + Shaper downed in 12 minutes total, no edits, no cuts. I do not recommend using Sadima's and Goldwyrms if you are lacking damage or clear speed in any way. If you can one-shot rares with them, then you can use them, if you can't, then don't. Also do not EVER use Ventor's. The rolls on these are very important because you're a Pathfinder. and as well on the Quicksilver for extra movement speed. Ample with +20 on the Diamond Flask(s) are necessary for you to be able to use them THREE times. Chill of Corruption -> 50% chance to generate a soul when you shatter an enemy, you HAVE to replace Conqueror's Potency to go full map mode setup because the +1 Projectile messes up VPS targeting! * Can be squishy if you face tank the wrong thing. 9K ES CI Wander PF don't exist anymore, so don't play this like one. The way the build works is by generating power and frenzy charges through the new insane Harbinger league helm, The Tempest's Binding, which effectively gives your Kinetic Blast a 6L with no drawback. Innervate gives you a huge damage boost, working similarly to Esh's Mirror, and also in conjunction to it as we're using it in the build too. The Ice Bite generates both frenzy and power charges through Herald of Ice's CoH + Assassin's Mark setup, as well as autobombing the entire screen with one click. You can opt out of using Bisco's Collar for a good rare amulet, but I'd recommend using it as it the cost of the final build ramps up quite heavily, and Bisco's definitely helps out. Thunderfists adds a lot of raw power and damage, which in turn result in more survivability with Vinktars, Leech passives, and Vaal Pact. 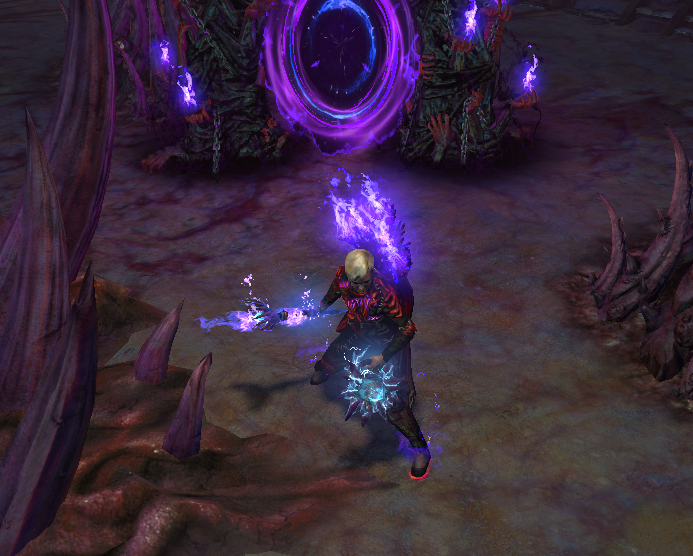 Esh's Mirror, same thing, and you can stack it in the boss room with Vaal Breach. Atziri's Step is just a good defensive boot. I didn't need resist there but you can use a rare if you want in this slot. It's up to you. Piscator is better than a 5 Ex wand and you can get them for like 5 chaos. The build currently has 92% chance to hit with around 3000 accuracy so I wouldn't really benefit too much from the shield, if anything I could probably get more accuracy on my left ring if I really needed it, Esh's provides me with an insane DPS boost in conjunction to the innervation buff, they stack really hard, it also has more health than Lyco as well as providing me with up to 40 lightning resists and shock reflection, so it adds more survivability. Since that helm is pretty expensive is there a helm to sub, until one could afford it? What I did was use a Starkonja's Head, although a Rat's Nest would probably be way better. Just use your Kinetic Blast in your until you can afford the helm. This is what I did and there is probably a better way. I found lightning arrow to be much better than tornado shot for the purposes of leveling this build. I transitioned into a Twyzel wand around level 40ish. It's a bit tough at first, but with decent gear, it's not bad at all. I got bloodcoil rings x 2 and a prismweave, all of which can be bought for 1 alch each (even basically perfect rolls). These 3 add a ton of dps to your kinetic blast and barrage. For the leveling process, I rushed to the duelist area for proj dmg and life, then up to the wand nodes and it has done well for me. Lastly, use Blasphemy + Poacher's Mark or Assassin's Mark to help with life and mana gain on hit/kill. That's probably the biggest boost for me. I even linked them to an AoE gem to help with the radius at first. Now I'm transitioning into the CoH + Herald of Ice + Assassin's Mark + onslaught link setup. Rat's Nest is pretty cheap (around 10-20C usually?) and is BiS for DPS until you can afford Tempest, Starkonja exists also, and is a much more defensive option but still providing good damage and you can get them for around a chaos.